Fur is in the Air.. I was so excited while attending that ParisJohn Galliano F/W 2010/2011 show (photo above), because art is blasting the boundaries imposed by one's mind.. And that was pure art! Art can always get Bigger. Better. Stronger. That's why fashion is so fascinating and we are so happy to have so many brilliant voguish minds around us.. 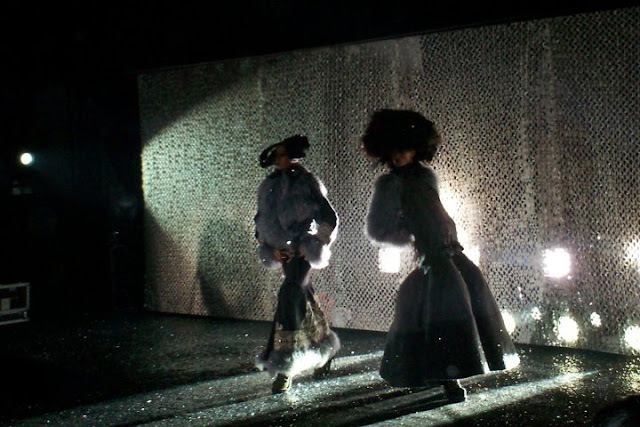 While watching the Alexander McQueen F/W 2012/2013 show, the same excitement of viewing something ingenious overwhelmed me.. Fur was everywhere. Creativity was exploding.. Through Sarah Burtons hands, Alexander McQueen became suddenly Alexander MyKing..
A mind that creates inter alia à la Daphne shoes can only be an angel sent from heaven, even if this mind has already returned home.. But thanks to all those terrific pieces, we have heaven on earth..
Because Beauty is the one and only Aim.. Because Perfection is the one and only Aim.. Because Fashion is the one and only Love.. Because.. There are places you just CANNES love.. There are people you just CANNES admire.. There are destinies you just CANNES not escape..